I custom make these name bangle bracelets on a gold tone rectangle with a gold tone brass band. 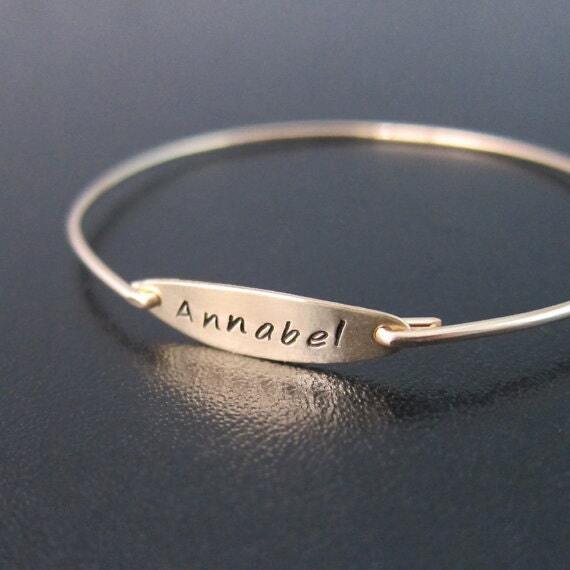 You can choose up to 8 letters or numbers for your name, a word or date for your custom bangle bracelet. These personalized name bracelets make great gifts for mothers, bridesmaids, and best friends. I can also make your rectangle bracelet with a 14k gold filled bangle for an additional $10. If you would like this option for your customized bangle bracelet, select from options when ordering your hand stamped custom bracelet. 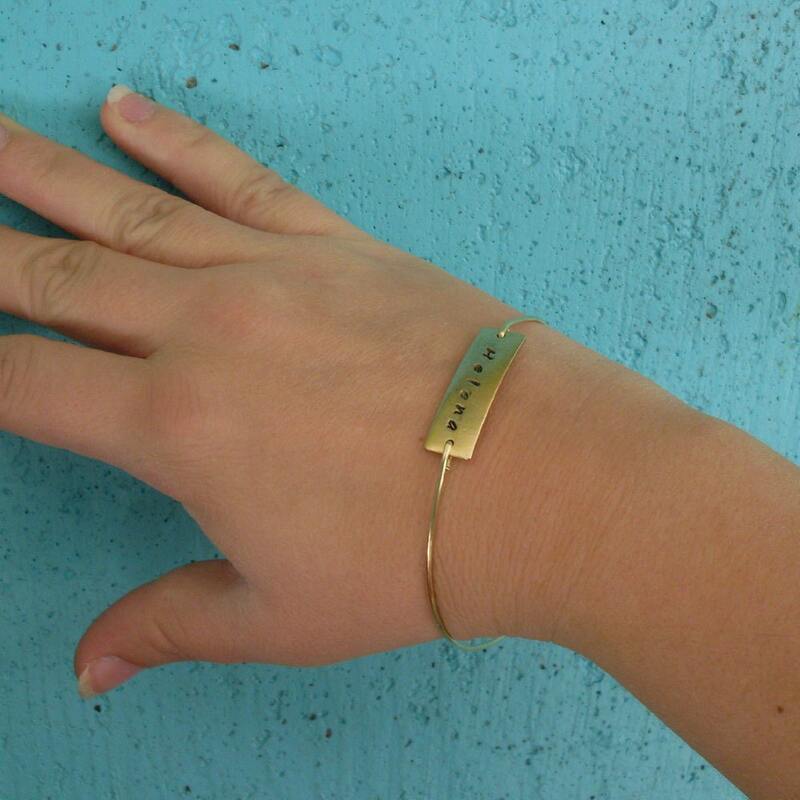 Please specify SIZE in notes to seller during checkout for your gold name bracelet. Choose from one of my regular sizes below by measuring one of your favorite bangles, or give me the circumference of the widest part of your hand where the bangle has to be pulled over; then I can size your rectangle gold bangle for you. All of my bangles are closed and can’t be opened. Therefore, this rectangle bangle bracelet. has to slide over the hand. 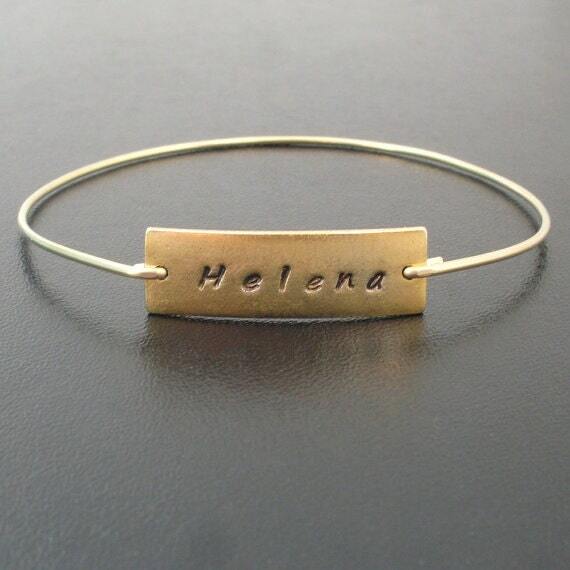 Custom sized: Specify a custom size for your hand stamped name jewelry, customized bracelet. This hand stamped whimsical jewelry, rectangle bracelet created and hand crafted with great care and love for you and yours. All of my items including this customized letter jewelry are special handmade creations that are original Frosted Willow designs. I hope you love this golden rectangle jewelry. The artist reserves all reproduction rights. No work may be reproduced in any manner, or derivative copy made whatsoever with out express, written consent of the artist. Various pieces may have different turnaround times. Processing & shipping is displayed in your shopping cart. If you need your jewelry right away, please select a priority shipping speed at checkout if available for that piece, and I will make your jewelry right away to go out in the next shipment using a faster shipping speed such as; USPS 2-3 day Priority Shipping, or USPS Priority Express 1-2 Day which is overnight to most places in the U.S... International times are not as fast. If you didn't include your jewelry customization requests in "notes box" during checkout such as sizes needed (see size chart below for bangles), initials or number of gift boxes, please send me a message at the following link with that information as soon as possible so I can make and ship your jewelry on time. I want to send your jewelry on time. And I want your jewelry to be made in the correct size on the first go around. However, if I'm not provided with important details such as initials needed, or size, I may have to alter the shipping date until I hear from you. Or I may have to make your jewelry in the most common size in order to meet the shipping deadline. Please let me know if you are sending this as a gift to someone and how many gift boxes you need. I'd be happy to include a card with a short and sweet message. Simply include your message to recipient in the comments box when you purchase. Each finished piece of jewelry always comes in a beautiful gift box. I will send you an email when I ship your order. If you have a special shipping request, just let me know at time of purchase so I can do my best to accommodate. While I can usually estimate a delivery date range for U.S packages, I cannot outright guarantee the performance of the shipper. International shipping times are hard to predict. With respects to international orders, you are responsible for any custom charges that might be added by the government. And there are too many differences for me to calculate any such custom charges into the shipping price. It has come to my attention that the UK in particular is charging a high custom charge on many packages. Please be aware of this potential extra charge before ordering. I want you to fully enjoy your purchase. If you are not 100% satisfied, please contact me, and I will do my best to make it right for you. I'm happy to re-size any bangles you ordered free of resizing charge. I only ask that you cover the re-shipping charges. Personalized or custom made items are not available to be returned, unless there is a defect such as incorrect initials... Custom made items include bangles made to a custom size specified by the customer... Or if a custom size wasn't provided to me in time to meet the shipping deadline, and I made the bangle size 8" as per my policies, this is still considered a custom size. Once again, I am happy to resize for you. Wedding jewelry / bridesmaid jewelry is not eligible to be returned. I work hard to make large orders for a wedding including multiple bridesmaids. And on occasion I've had customers attempt to return jewelry after the conclusion of their wedding. Other pieces can be returned within 30 days of the order date. As soon as I receive the item, I will issue a refund to you for the price of the product, not including the shipping charge unless their was a mistake on my part with the order. I cannot refund or replace any items that have somehow gone missing from your delivery address, but have been marked "delivered" by the USPS tracking system. Do you have a store and want to sell Frosted Willow bangles? I offer wholesale pricing. Please contact me to discuss discounts and minimums. 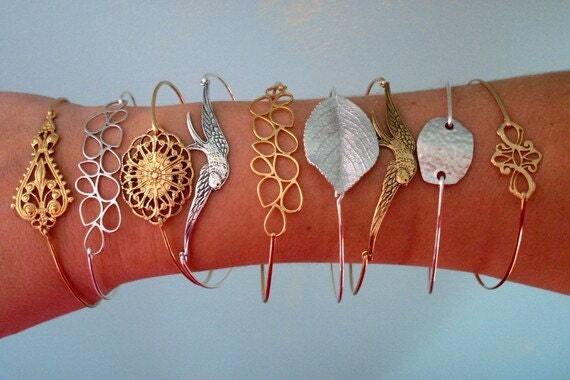 My line of bangles has been very popular in stores. As the artist, I retain all copyrights of my work and it is not licensed without my explicit permission. I also retain the copyright of the images of my work as displayed on this website and others.